Traditional beer cheese soups are normally creamy, but I like some bite in my soup. So for this recipe we decided to add potatoes. They makes the soup a little more hearty and add a nice texture. If you still prefer your beer cheese soup creamy, then you can blend the soup after it has finished cooking! Easy Peasy! Now everyone is happy:) This recipe calls for 2 cups of our beer cheese sauce. I never have trouble finding ways to use up our beer cheese! We also baked up some of our Soft Challah Pretzels to dip in the soup, but made them into cute little bites instead of giant pretzels. And just think, you can dip the leftover pretzels into the leftover beer cheese. EEEKKK!! The recipe that just keeps giving! Beer, cheese, potatoes, soft pretzels….all I can say to that is CHEERS! Heat butter in a large pot, or dutch oven over medium /high heat. Once the butter has melted, add the onions, garlic, and celery and cook until the onions become translucent. Sprinkle the flour over the onion and celery, and allow it to cook for several minutes. Pour in the milk, broth, and beer cheese sauce. Add the potatoes, mustard, salt and pepper. Add in the cream cheese, using a whisk to make sure it breaks up and mixes into the soup. Finally add the beer. Let the soup simmer for about half an hour to 45 minutes over low heat so it can thicken. Be sure to stir a few times to make sure nothing is sticking to the bottom. If you taste the soup and feel like you want more cheese, you can add in the vegan cheddar shreds. I personally like it without the added cheese, but some prefer it extra cheesy. You can also just add sherds to the bowls when serving! You can serve the soup with Soft vegan challah pretzels. 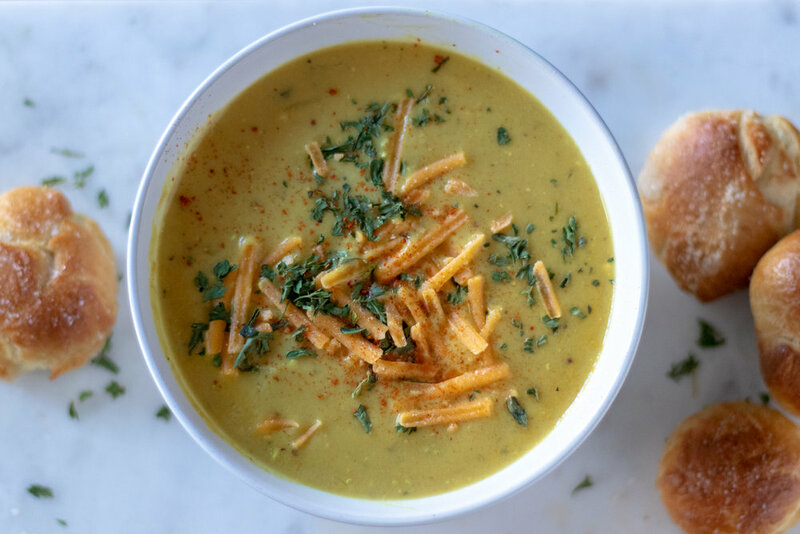 We took our Soft challah pretzel dough and formed little pretzel bites to go with this soup! But you could also make soft pretzel sticks or a traditional pretzel shape. To make the bites, follow the instructions for the regular pretzel recipe, but instead of forming them into a pretzel shape, pinch off golf ball sizes of dough and roll them into balls. Continue with the recipe process. Your bake time on the bites will be shorter, so just keep an eye on them and remove them from the oven once they are nice and golden brown. Spicy “chicken” Southwestern soup, topped with avocado…you had me at avocado! This soup has just the right amount of spice, packed with black beans, corn, and shredded jackfruit, it is hearty and so delicious. And did I mention how quick and easy it is to throw together, making it perfect for a healthy weeknight dinner! Bake up a pan of our Perfect Vegan Cornbread, and you are sure to have a meal that leaves everyone full, warm, and satisfied! Drain jackfruit and finely chop the pieces, or I find it faster and easier to just shred the pieces of fruit between my fingers. If you have never used canned jackfruit before, the pieces are kind of triangular shaped and soft. They easily come apart resembling shredded meat. Be sure to find jackfruit in brine vs jackfruit packed in syrup. Heat a large pot or dutch oven over medium/hight heat, and add 1 - 2 teaspoons of oil. Add the diced onions, can of green chilies, and the jackfruit to the pot. Let the veggies sauté until the onions become soft. Add the beans, corn, tomatoes, broth, seasonings, cilantro, and lime juice to the pot. Stir well and lower the heat to low. Cover the soup and let it simmer for about 25 minutes. Taste and add more salt, pepper, or other spices if you feel like you would like more. While soup is simmering, dice the avocado and some extra cilantro for the garnish. To serve soup, top with diced avocado, more cilantro, and crispy tortillas strips if you like. You can also stir in extra hot sauce or vegan sour cream. If you are missing classic chicken and rice or chicken noodle soup, this recipe is for you! We use jackfruit to mimic the chicken and orzo in place of noodles or rice! This soup is savory, delicious, comforting, and so easy to throw together. 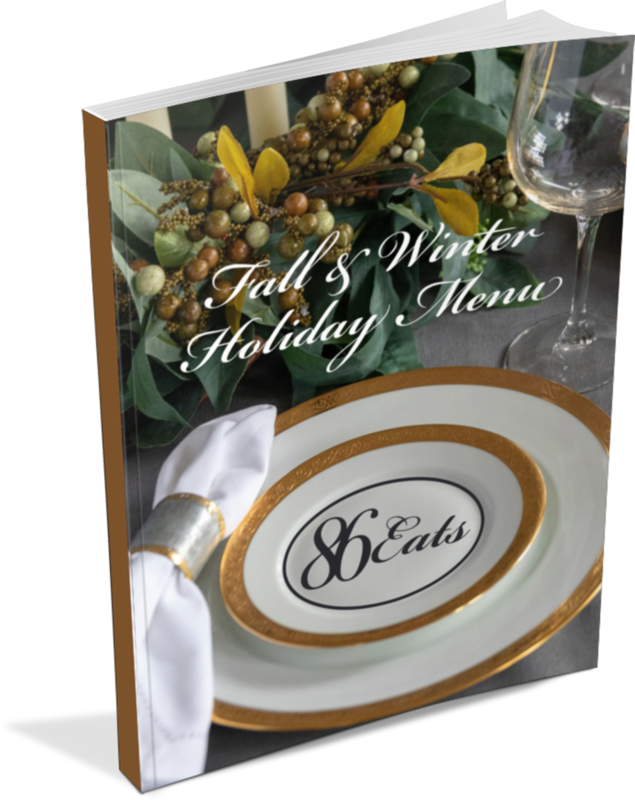 Perfect for chilly weather, or for helping mend a cold or flu. It also will freeze really well, so go ahead a make a double batch and freeze half. That way the next time you are feeling under the weather, you can easily thaw and heat a batch of this classic comforting soup! In a large pot or dutch oven, heat a few teaspoons of oil over medium heat. Add onion, carrots, garlic, and celery, and allow to cook until the onions are translucent. Drain jackfruit, and roughly chop the pieces, or use your hands to shred them. Add to the pot, along with 2 teaspoons of Better than Bouillon. Sauté the jackfruit with the veggies, and the bouillon paste for a few minutes. Add the water, and remaining ingredients. Stir well, then educe heat to low, and simmer for 25 - 30 minutes. Dice onion. Heat a small sauce pan on medium heat with a teaspoon of oil. Add the onion and garlic and saute until the onion is translucent. Add the onion, and both cans of tomatoes to a high speed blender, or food processor. Blend until the mixture is smooth. Transfer mixture to a large pot, or dutch oven. If using Better Than Bouillon, whisk it into the the 1 cup of water and add to the pot. If using vegetable broth, add it to the pot. Bring the pot to a boil, then reduce heat to a simmer. In the same blender or food processor you used for the tomatoes, (no need to even rinse) add the soaked and drained cashews, and the 2/3 cups of water. Blend until completely smooth. Add the cashew cream to the pot with the tomatoes. Add the seasonings, and stir. Allow soup to simmer for about 20 minutes, stirring occasionally. Serve garnished with fresh herbs, or vegan parmesan cheese. I love this loaded baked potato soup because it is a quick, easy, and filling dinner if you are pressed for time. 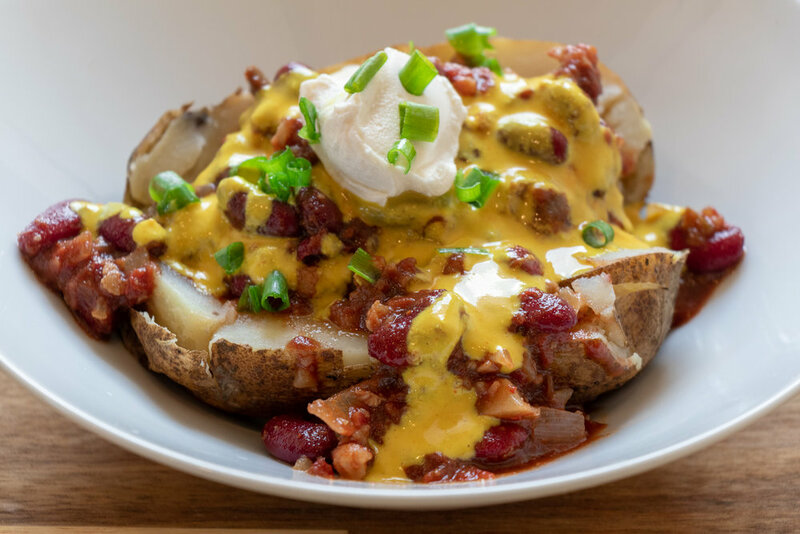 You could easily use leftover baked potatoes, or prep some baked potatoes over the weekend for an ever quicker weeknight dinner! Use whatever toppings you have on hand for this hearty, delicious soup, that will leave you full, and satisfied! Wash potatoes. Pierce through each one a few times with a sharp knife. Place on a baking sheet, and bake at 400 degrees for 30 minutes, or until a knife will easily pierce through the potatoes. Remove from oven, slicing each potato open to allow to cool. Heat a large pot, or dutch oven on medium heat on your stove top. Add 1 tablespoon of butter, then add the onions, and cook until soft, and translucent. Add the other 2 tablespoons of butter allow to melt. Next, sprinkle the 1/3 cup of flour over the onions. Allow the flour to cook for a few minutes, and incorporate with the melted butter. Whisk in the milk, water, and Better Than Bouillon, and reduce heat to low. Let soup simmer, and thicken for about 15 minutes, stirring occasionally. Once the soup has thickened, scrape out the insides of the potatoes into the pot. Use the back of a wooden spoon to mash up the pieces of the potato a bit once in the pot. Stir in the sour cream, pepper, and extra salt if you think it needs it. Let simmer for another 10-15 minutes. Serve soup topped with diced green onions, more sour cream, vegan cheese shreds, or coconut bacon. Every time I make a batch of my vegan chili, I freeze the leftovers in smaller freezer bags so I can thaw them quickly for an easy weeknight dinner, like chili cheese baked potatoes. So yummy and satisfying, and so fast to throw together when you are pressed for time! Wash potatoes. You will also need 4 - 6 pieces of aluminum foil large enough to wrap around each potato. Add 1/2 teaspoon of butter to the middle of each piece of foil. Place potato on top of butter, and poke a sharp knife into each potato a few times. Sprinkle with garlic powder, salt and pepper, and tightly wrap foil around the potatoes. Place potatoes on a baking sheet, and bake for about 30-40 minutes, depending on size of potatoes. When you can easily poke a knife into the potatoes, they are done. While potatoes are baking, make the cheese sauce by adding all of the ingredients except the chilis to high speed blender or food processor, and blend until completely smooth. Transfer the cheese mixture to a medium pot, and heat on medium/ low heat, whisking continuously until the cheese begins to thicken to a queso constancy. This only takes a few minutes. If it gets too thick, you can add a little more water to thin it back out. Add the chilis and stir. Top the potatoes with 1/4- 1/2 cup vegan chili, some cheddar queso, and whatever toppings you like to serve. I love chili!! I love it plain, on a baked potato, on a carrot dog, on some fries with some cheese, on latkes at Hanukkah. I love it summer, fall winter, or spring. This chili is hands down my favorite recipe. Its simple, and super easy to make. Freeze any left overs for a quick weeknight dinner in a pinch. Chop cauliflower to a fine chop, or put it in your food processor and pules until its good and broken down. We are using the cauliflower in place of ground meat, and are trying to get that sort of texture. Dice the onion into a fine dice. Heat a dutch oven or large pot on medium heat. Add a few teaspoons of oil. Once the oil is nice and hot, add the onion and cauliflower. Heat the onion and cauliflower until the onion becomes translucent. Next, add in the remaining ingredients. Add more or less of the beer or broth depending on how thick you like your chili. You can alway add more if it thickens up too much for your liking. Give it a good stir and reduce heat to simmer. A side not about the cocoa powder. I know for some people it will seem like an odd ingredient, but it really does make this chili special. I highly recommend you don't skip adding it! I promise you will never want to make chili without it again. Allow chili to simmer with a lid on for at least an hour, stirring occasionally. I typically start my chili in late afternoon and just let it simmer until dinner. CROCKPOT OPTION: You an easily make this chili in a crock pot. I normally just saute the onion and cauliflower first before adding it. Set your crock pot to medium heat, and allow to cook for 6-8 hours. This recipe makes a large pot of chili. If you are a small family, or single, you can freeze the leftovers for several months. I typically portion the cooled chili in freezer bags, in smaller portions. I will thaw the smaller bags of chili to use for toppings on loaded baked potatoes, chili cheese fries, carrot dogs, latkes, or nachos. In a large pot or dutch oven, add a few teaspoons of oil and heat. Add diced onions, and minced garlic, and cook until onions become translucent. Add onion and garlic to a blender or food processor, along with the pumpkin, and 2 cups of the vegetable stock. Process until completely smooth. Add mixture back to the pot with the rest of the ingredients, and remaining 2 cups of broth. Stir well, and let soup simmer for 20 minutes. Serve topped with tofu scallops. Wrap tofu in a clean kitchen towel, or a few paper towels. Place a few books on top of the tofu for 15 minutes to remove excess liquid. Mix aminos, garlic, salt, maple syrup, and liquid smoke in a 9x13 or other large shallow dish. Cut block of tofu in half length wise. If you have a a small circle cutter, begin cutting circles resembling scallops from the the two pieces of tofu. You will have scrap pieces left over. Save them, and toss in marinade as well. They will still taste good, just wont look as nice as the circles. You could also use the scraps for something else later. If you do not have a circle cutter, you can just cut 1 inch by 1 inch cubes from the tofu. Place tofu in the marinade, and let sit covered in the fridge for at least one hour. When tofu is ready, heat a large skillet over medium heat, adding a few teaspoons of oil. Add tofu pieces and some of the marinade to the pan. Cook until each side begins to brown and the scallops get a crispy edge. 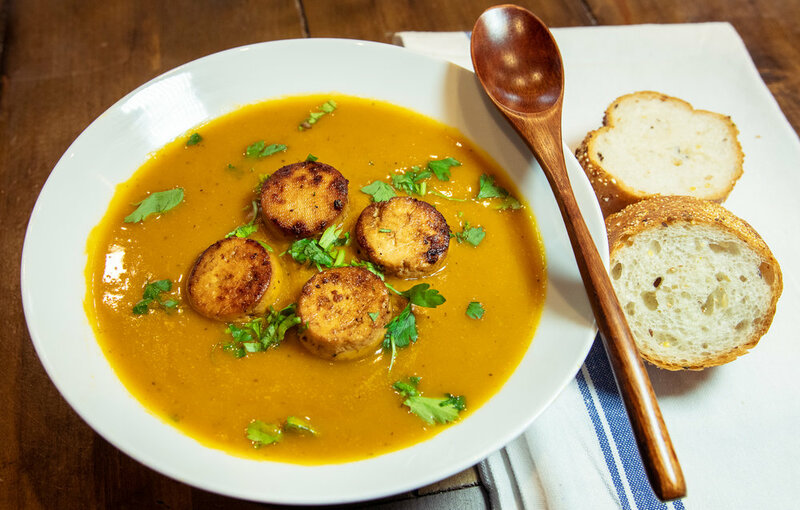 Add finished scallops to the pumpkin soup, and serve while hot. Prepare fluffy southern biscuit dough minus 1/8 - 1/4 milk. You want this dough a little firmer than the biscuit dough so adding a little less milk will help the dough be more firm. You just need to be able to handle the dough without it being too sticky. Once the dough is made, pat it out into a 1/2" thick oval and cut the dough into roughly 1 inch by inch dumplings. Drain and shred 2 cans of jackfruit using a fork or your hands. Mix 2 teaspoons of vegetable Better Than Bouillon with 8 cups of water, or you can use 8 cups of vegetable broth. In a microwave safe container (I use a large glass pyrex measuring cup) microwave the cashews and 1 1/2 cups of water for 3 minutes. Add the cashews and water to a high speed blender or food processor, and blend on high until the mixture is completely smooth and resembles heavy cream. Set your slow cooker on medium heat and begin adding all of the ingredients except for the dumplings. Once everything but the dumplings are in the pot, give it a good stir. Now add the dumplings in a single layer on the top of the stew. You may have dough left over depending on the size of your slow cooker. If you over crowd them, they will all stick together. You can always bake the extra dough into biscuits. Allow the stew to cook for 7 - 9 hours. You may have to give the stew a stir in the middle of the cooking process to make sure the dumplings are getting cooked through. Store leftovers in fridge for up to 5 days or freeze for up to a month.